The Preventive Cardiovascular Nurses Association has developed this series of Heart Failure handouts for nurses and other health care providers to use with patients. Join as a member today to take advantage of member pricing. These NEW digital guides may be used in the clinical setting or at home. The focus is on what patients need to know after a diagnosis of heart failure. Topics include managing symptoms, when to call 911 or the clinic, resources, medicines, and everyday living—including mood and activity. Funded through an educational grant from Novartis Pharmaceuticals, Inc. The following tools are also NEW—they are a folded 11x17 sheet, intended to be used in the transition from hospital to home. It can be used either on its own or as a cover for one or more of PCNA’s other printed heart failure sheets. 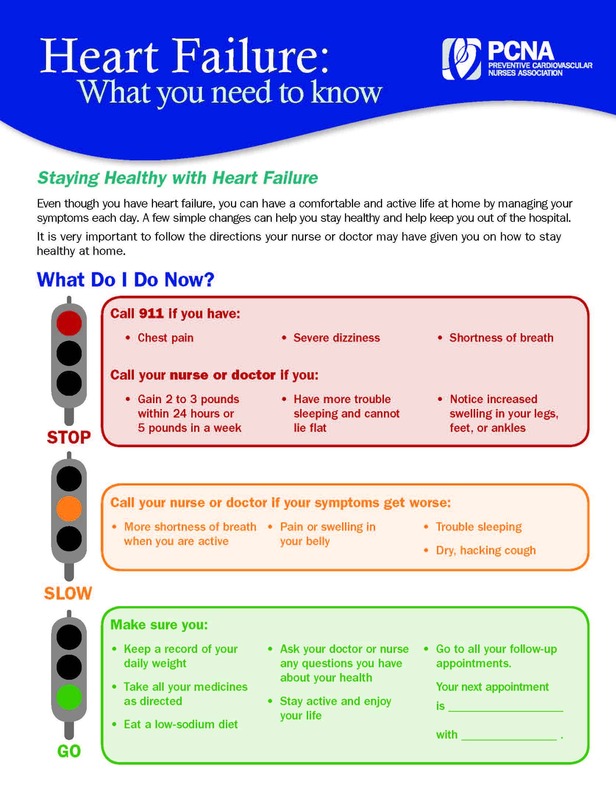 Give your patients with heart failure the critical information they need at discharge from the hospital. Try this modular approach to educating patients on the “need-to-knows” in a format that can be provided in stages and supplemented with take-home fact sheets. Patients will learn the causes of heart failure, how to manage it, and how to tell if a change in treatment is needed. Knowing what to expect during and after treatment can be overwhelming. Help patients understand heart failure medicines, procedures, and devices like implantable pacemakers and defibrillators. 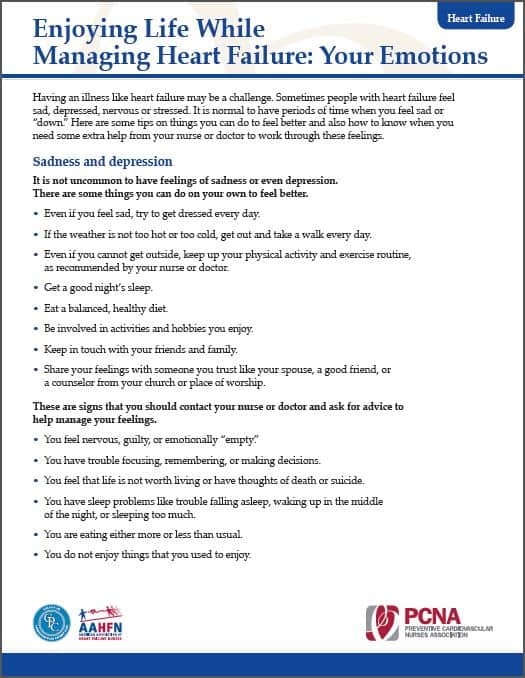 Give patients the information they need to better manage their heart failure-related emotions. 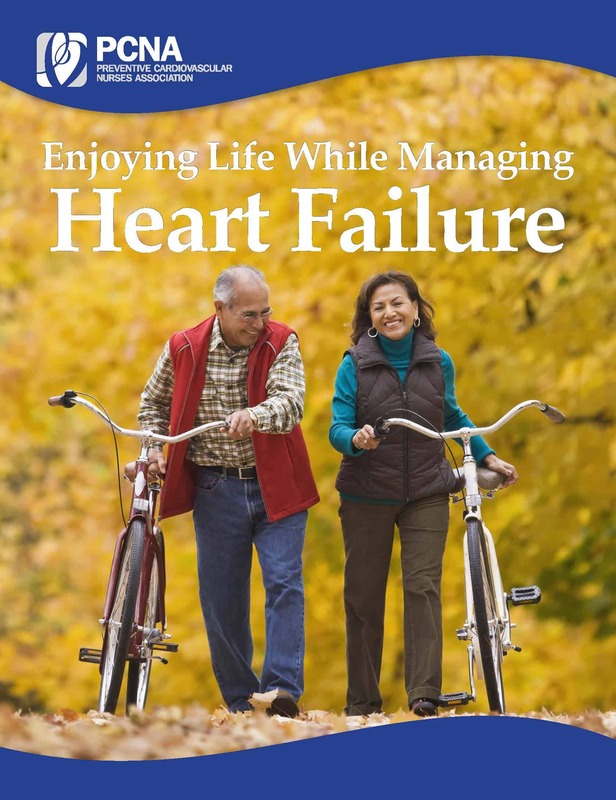 The goal is to give patients a better understanding of what to expect when living with heart failure, as well as tips and suggestions for when to consult their healthcare provider. Patients can also gain knowledge on how to manage stress levels and maintain heart health. Regular exercise is an important part of heart failure management. Patients will learn how to exercise safely and effectively to get the most from their workouts. Patients learn the importance of moderating sodium in their diet, which foods contain the highest levels of sodium, how to reduce sodium intake, and which seasonings can be substituted for salt. Encourage patients to document questions and concerns, record symptoms and track weight to share at each clinic visit.